This little cake recipe is nearly a staple food! It came to us by Wades mother, she thought of us when we had too much rhubarb to deal with. Check out this recipe! 6 cups of glorious Rhubarb! What other recipe uses that much?! 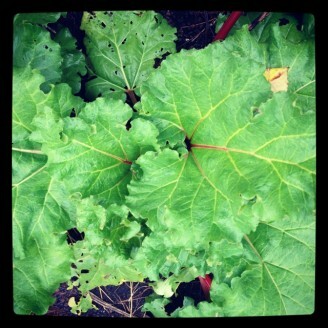 If you don’t already have a rhubarb patch, then you might be inspired to plant some soon. It’s a beautiful plant, easy to care for too! We prefer this cake with dark brown sugar (another happy accident!). 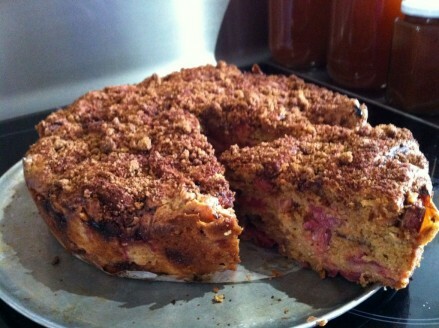 Its a moist cake, with a rhubarb ‘tang’, and then comes the sweetness! We’ve had this cake demolished by the hardest male ‘meat-only’ types, and seen a couple of grown ladies throw tantrums when it runs out! Don’t mind them, try it yourself! Preheat oven to moderate. Grease deep 23cm round cake pan, line base with baking paper. Beat butter, rind, sugar and eggs in medium bowl with electric mixer until light and fluffy (mixture may curdle). Stir in sifted flours and cinnamon and cream, in two batches, stir in rhubarb. Spread cake mixture in prepared pan, sprinkle with combined extra sugar & extra cinnamon. Bake in moderate oven about 1.5 hurs. Stand cake in pan for 5 minutes. Turn onto wire rack to cool with a plate so you don’t loose all the yummy cinnamon sugar on the top. Our family favorite cake, we hope it could become yours! This entry was posted in Home-life Skills, In the Kitchen, Uncategorized and tagged Brown Sugar, cake, facebook, humble house, Rhubarb by humble house. Bookmark the permalink.